Shop Smart offer: Spend £25 and receive a 5% discount with your Shop Smart card. 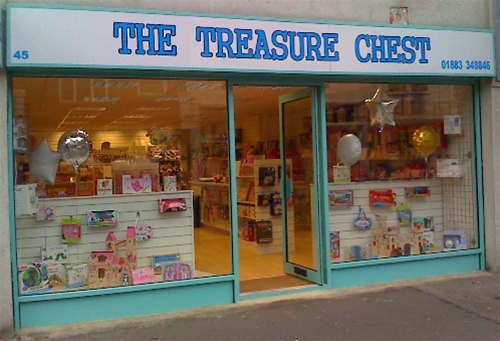 The Treasure Chest provides a wide range of gifts for the whole family, whether young or old. Many of the items are available both in the shop and on our web site. Our other shop, Tots N'Weenies, is nearby in Church Walk Shopping Centre, for products aimed at the youngest members of the family. In both shops great care is taken in choosing our products. As a business we deal with only reputable companies such as Clippasafe, Rainbow Designs, Orange Tree Toys, Manhattan Toys, Gund. East of India and many more, giving us a varied range of items in our shop and through the web site. All our products comply with British and European safety standards and carry the CE mark where applicable.